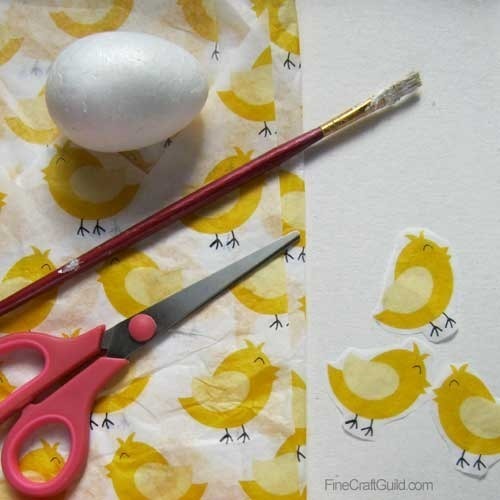 :: Learn how to Make Tissue Paper Decoupage Eggs :: Cheer up a dozen of natural or Styrofoam eggs with shapes and patterns from decorative tissue paper and make them into unique Easter table decorations. This is a cool crafts for kids as it does not require perfect cuttings. Just roughly cut around the edges of your design. 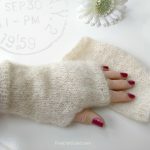 You can also choose part of a design. 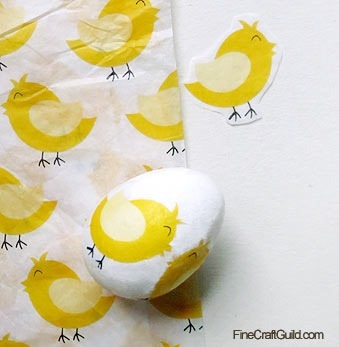 What I am working with is a tissue paper with the bold, graphic Easter chicks, and I loosely cut around the edges leaving lots of white paper on. As the tissue paper is so thin and gets a bit wet with the glue, the white edges blend with the white of the foam or eggshells. Eggs. If you use real eggs, you should pre-boil and cool them. You will have to throw these away after Easter though. This is why I went with Styrofoam Eggs , which will last year after year, allowing you to build up a collection of matching Easter decorations around the home. Color Tissue Paper . And, start now with collecting cute and colored designer napkins & printed tissue papers as they enter your home. This way you can recycle and use them when you are ready to do this craft. Otherwise, you will have to buy tissue papers (and don’t get me wrong, there are some beautiful Decorative Paper Lunch Napkins made from tissue papers on the market that are perfect for this decoupage project). Paper scissors. Dollar-store quality is fine in most cases as we don’t need exact cuts. Small children should use these kind of Kids Scissors for protection. Simple craft glue. Mod Podge will do. Step 1. Cut out couple of matching shapes to decoupage. 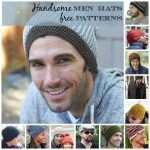 Choosing a complicated design? Lay your design elements out flat to see how they would fit on the egg. Once you like the design, go to step 2. Step 2. Optional: Cover entire egg with glue. If you wish, add in a bit of colored paint (see below for variations). Let it dry. Step 3. Glue design elements onto your egg, one by one. Smoothen paper with your brush. Let it dry. Step 4. Cover with a third layer of glue, to make the entire egg shiny and the design durable. E voila’, a decoupaged Easter egg with kissing chicks. Cute, hey?! Create an Easter egg vignette, showing off your own decoupaged eggs. You can display your Easter decoupage eggs as a grouping in any Easter flower vignette, or simply in Easter baskets. 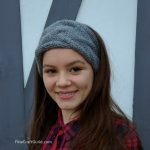 Learn here how to make yourself (recycled) paper baskets. We feature all sorts of techniques and shapes. 1. Natural Easter Eggs with Stick-on Craft Foam Flowers. 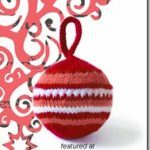 These eggs can look adorable and this is a suitable craft for small children as well. 2. For an adult version using craft foam shapes, stick your stickers on and then paint your whole egg carefully in a color that is in high contract to its base color (usually white or beige). When your decoupaged+painted eggs are dry, peel off the stickers again. And voila, you have yourself some artsy silhouette Easter eggs. 3. 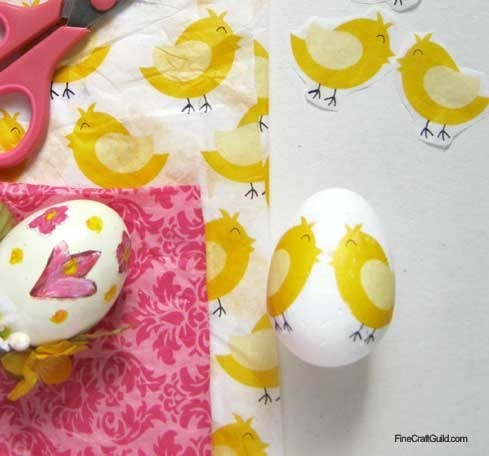 Another technique is to paint the entire egg first, before gluing on your pretty decoupage images. 4. A fourth technique is to decoupage the entire egg. Perhaps paint over it with a glitter glue or metallic paint. When dry, add the featured images. Let it dry and seal with thin layer of decoupage paint aka craft glue. 5. You can also add 3D roses, flowers, leaves, butterflies, ladybugs, or other little critters. You can buy ready-made shapes or shape your own using tissue paper, polymer clay, or similar. Attach your design elements with a glue dot add these onto your eggs. Note; the egg on the bottom left has real decoupaged flowers, which are lightly painted over to retain color over time. Decorative craft flowers are glued on at the bottom of the egg. That egg has several layers of varnish, giving the egg a nice solid shine. 6. How about creating strips of colored tissue paper and layer these on top of each other, overlapping and slightly going over to create nice tonal color effect. Tip: Work on layer by later and let things dry in between to avoid a gooey mess. … and I am sure you’ll have more ideas. These are just 4 that came to mind quickly. Be sure to visit our Easter crafts – section for more ideas: decorative Easter vignettes, Easter flowers, Easter Eggs, Easter brunch recipes, and all kind of last minute Easter ideas as well.